Autumn leaves, temperatures between 40 and 60 degrees, soup and bread, seasonal cocktails, and cozy sweaters make life one hundred percent better. Today, we are celebrating the season with three of our favorite fall recipes from our Surrey Books collection! So, go borrow some sugar from your neighbor and stock up your bar cart, because you're going to want to get started on these recipes from Market-Fresh Mixology by Bridget Albert with Mary Barranco, Soup & Bread Cookbook by Martha Bayne, and The Fly Creek Cider Mill Cookbook by Brenda and Bill Michaels right away. Don't forget to tag us in your "cheers" Boomerang on Instagram and your #KitchenMasterpieces on Twitter! 1. The perfect pre- or post-dinner drink for the upcoming Thanksgiving holiday: a Pumpkin Cocktail. To rim the glass: Measure sugar and cinnamon onto a small plate. Rim outside top of glass with lime wedge. Roll the outside rim of glass in sugar mixture. Set aside. Add pumpkin liqueur, orange vodka, half and half, and Vanilla Syrup to mixing glass. Add ice to tin. Shake well. Strain into cocktail glass. Garnish with a gooseberry. Peel back the outer leaves of the berry. Slit the bottom of the berry. Rest on the rim of the glass. 2. Never go wrong with soup for the perfect main course on a chilly fall evening. This Potato, Butternut Squash, and Leek Soup gets double points for using seasonal vegetables! Place the squash pieces in a roasting pan, drizzle a little olive oil over them, and toss them with the coriander and salt. Roast in a preheated 375˚F oven for an hour or more, until soft and a little bit caramelized. Remove from the oven and set aside. Continue to simmer for another few minutes or until the squash is totally soft. Puree the soup and return to pot, if necessary. (If you’re using squash puree, add it after pureeing the potatoes and leeks and stir by hand until the orange streaks have vanished.) Add more salt, if needed. Garnish each serving with chopped parsley. A touch of lemon zest or juice with each serving brightens the soup nicely, as well. 3. The best part of the meal: sweets. 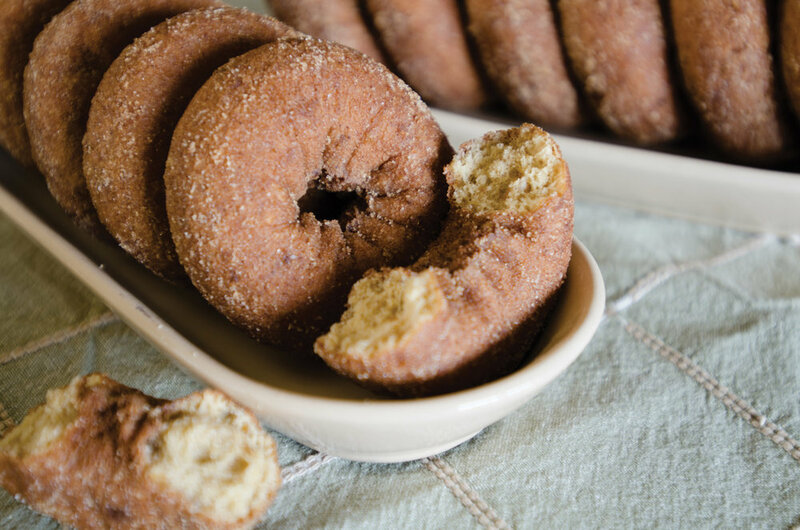 But don't restrict these delicious Apple Cider Doughnuts to the end of the meal, try them for breakfast. Or for a 4pm snack. Or ... really whenever. 1. Place the cider in a small nonreactive saucepan over medium heat. Bring to a boil; then, lower the heat and simmer until reduced to ⅓ cup. Remove from the heat and set aside to cool. 2. Combine 1 cup of the sugar with 1 teaspoon of the spice mix in a shallow bowl. Set aside. 3. Combine the remaining 1 cup of sugar with the flour, baking powder, baking soda, remaining spice mix, and salt in a large mixing bowl. 4. Combine the cooled cider with the eggs, buttermilk, and melted butter in a small mixing bowl. When fully blended, stir the liquid into the dry ingredients, mixing until combined. The dough will be sticky. 5. Generously flour a clean, flat work surface. 6. Scrape the dough onto the floured surface. Lightly flour your hands and pat the dough out into a circle that is 13 inches around and ⅓-inch thick. 7. Using a doughnut cutter (a round cutter with a hole in the center), cut out as many doughnuts as possible. Repeat the process with any remaining scraps once; after one repeat, discard remaining scraps since the dough will become tough if worked too much. 8. Place the oil in a deep fat fryer over medium heat, and bring to 370°F on a candy thermometer. 9. Using a spatula, carefully transfer a few doughnuts to the hot oil. Do not crowd the pan. The doughnuts should rise to the surface as they begin to cook. Fry, turning once, for 3 minutes, or until light and golden brown. Using a slotted spatula, transfer the doughnuts to a double layer of paper towel to drain. 10. Continue frying until a few doughnuts at a time until all of the dough has been used. 11. Let the doughnuts cool for a couple of minutes. Then, transfer one at a time to the dish of the spiced sugar mixture and turn to coat lightly. Serve warm or at room temperature. Catch up on our latest posts and newest releases below!